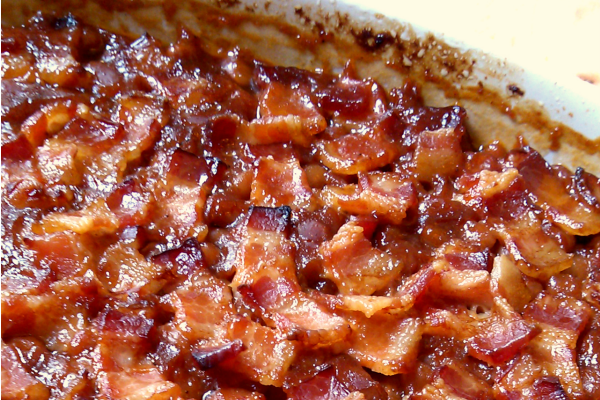 A classic Southern-style baked beans recipe made with brown sugar topped with bacon. You know how you lay slices of bacon on top of baked beans and they cook up all glorious? Except that they shrink up so much that when the beans are done only the center of your dish has bacon. And you’ll have like 5 slices but it’s impossible to cut them with the serving spoon so only 5 people actually get the bacon. There are the recipes that call for cooking the bacon first and crumbling it on top. But, as I've said many, many times around here, ain't nobody got time for that. So here’s what I do! 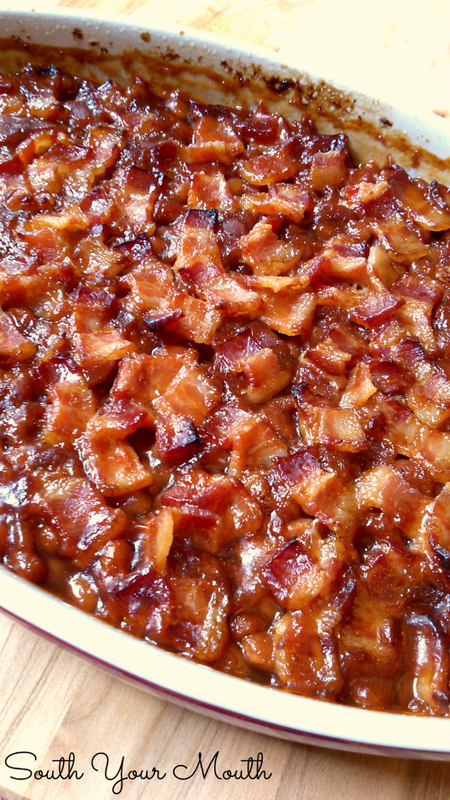 I mix up my very favorite baked beans then top them with a gozillion nuggets of bacon that crisp up and work their magic while the beans are cooking. End result? Bacon for everyone! Cut bacon into 1/2 inch pieces then place pieces evenly in a single layer on top of beans. I like to kinda crumple each piece a bit instead of laying them flat – like little inchworms. The cute ride-on toys from the 80’s not actual worms. Bake beans, uncovered, at 350 degrees for 1 to 1.5 hours or until bacon is cooked through and starting to crisp. Enjoy! *Not “baked beans” or “barbeque beans” or anything fancy like that as they’re already jazzed up. You just want plain jane, inexpensive "pork n' beans". I usually buy Van Camp’s or Libby’s. ALSO, be sure to keep the cans upright until you’re ready to cook. You want all the liquid to settle on top so you can pour it off. You might also enjoy this recipe too! Just had a "duh" moment. I use Van Camp's for my recipe and it never occurred to me to pour off some of the liquid. I am so trying that next time. This is so similar to how I make my quick baked beans, only drain and rinse the beans (either pork n beans or bush's baked beans) and then I add bacon's best friend, onion. I actually laughed out loud while reading your description of the 5 pieces of bacon distribution! This recipe looks yummy, hope to make it soon. My sister had a store with a deli. Many Saturdays in the summer I would go in and smoke ribs. The lady who worked in the kitchen would do the baked beans. I didn't realize she was off the previous night until it was time to start thinking about taking the ribs off. No baked beans? Horrors! Stove-top Baked Beans were born. Drained beams in a colander while I was sauteing onions. Added brown sugar, mustard and ketchup and crumbled bacon (from breakfast). Added the beans. Everyone was amazed how well they turned out. Well, I didn't have all night to bake the darned things!! With pork sausages! That would be a great combo. These beans sound delicious. Sound very much like an incredible recipe I used to have. Trying to find one like it. This sounds pretty close. I do believe there were lima beans in mine as well. Definitely the liquid smoke is the magic. Your comment let me know that these ARE really delicious! What kind of BBQ sauce do you use with this recipe? I never considered Van Camp beans as cheap. Use them all the time. Going to try this recipe . Sounds delish. Is there any way to do this in a crock pot? I think so but you'll need to cook the bacon in a skillet then add to the top about an hour before you're done. I'd cook on low for 6 hours or high for 3-4. I dice up slices of bacon, cook and then add to the beans with onion and syrup (once I was out of brown sugar and substituted the syrup and liked it better). My fiance is allergic to Worcestershire sauce. Is there anything else that I can substitute with for recipes? You can just leave it out and it will be fine. I'd normally substitute with equal parts fish sauce, cider vinegar and molasses but I have a feeling he might be allergic to the fish sauce if he's allergic to the worcestershire. My mother has a similar recipe and at Thanksgiving replaced it with soy sauce. It tasted the same. However, think there is fish sauce in it as well.. This is my go to baked beans recipe now! Everyone always comments about the little pieces of bacon and how they like that. I tell them your "5 slice" story and they laugh in agreement! 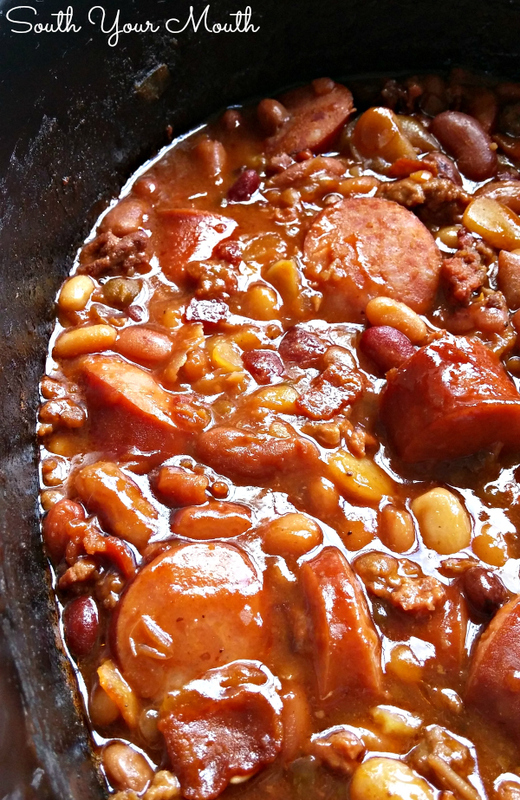 I love that your recipe uses simple cheap pork n' beans! I always add an onion because my family loves some onion! Thank you for a great recipe and fun story! Do you cook the bacon before you add it to the top? Yum! Yummy! Yummers! I LOVE bacon in my beans. These are a real winner! Thanks for sharing with us at Weekend Potluck. So, the bacon grease - that I assume comes out during baking - doesn't pool on top and look, um, unappealing? I love your clever blog name!! So disappointed I thought this was an actual recipe for baked beans. So disappointed at the lack of kindness and grace in the world these days. a little late to the party ,but you can always precook some navy beans and it will be an actual recipe !! I made these beans overnight for today's Independence Day celebration. I always chop up green peppers and a small onion with my beans (using Bush beans), but this time I skipped the onions. I slow cooked the recipe over night in a 225 degree oven (6 hours) using a bean pot, then added the bacon the last hour. OMG!! To die for. The only negative was keeping my husband's hands off of them so I can get them to the family barbecue! Mandy, you say in the recipe to keep the cans upright so all the liquid settles on the top but wouldn't that mean you would keep the cans upside down? I may be misunderstanding what you mean...can't wait to make these!!! The beans are heavier than the liquid. The beans SINK to the bottom of the can and the liquid rises to the top no matter which way the can is turned. Even us dumb Yankees know that! What about the bourbon in the recipe? Surely it can't be Southern without bourbon! Mandy, I have tasted and loved Southern Baked beans on my trip to LA and that's where I bought my lil' bottle of liquid smoke. But since then I have turned vegetarian (not vegan) so can I use a combination of three beans (a can found at my local Aldi) and bacon salt to bring it close to this recipe? Or just a can of kidney beans? Well, the pork 'n beans come with a sauce. I'd buy a vegetarian variety of baked beans! Do you know approximately many people this single recipe would feed by chance? 16-20 servings. I can clearly see you don't have my 13 year old grandson at your table. Made this amazing recipe for 4th of July for 12 of us. Peter was not there. Planning it for tomorrow's family dinner and will have to at least double it to accommodate Peter and his 10 year old brother. These boys love their beans. These are in my oven as we speak. Can't wait to give them a try, they smell delish! I've used a similar recipe for 35+ years for my Baked Beans. I've done the 5 strips of bacon on top; or, dicing and cooking beforehand, the bacon becoming way over done (almost burnt). I've always cooked bacon (almost done) and onions together and mixed in with the beans. That way there's always bacon in every bite... but I've always wanted bacon on top! Hubby and I are celebrating our birthdays tomorrow with our daughter, son in law, and 6 year old identical twin grandsons. I'm going to use your technique for the bacon on top. I'm so excited! I'm going to be in hog heaven with the baked beans. In fact, my Baked Beans are always asked for to bring to a potluck. I make them in a BIG lasagne pan (aluminum throw away) so I don't have to worry about getting a dish back. 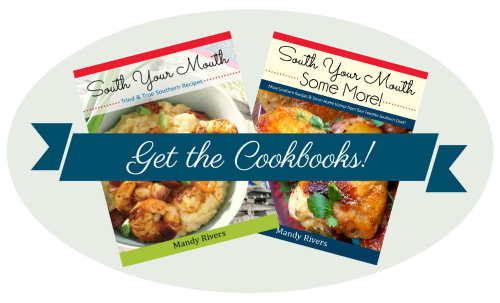 I love your "South Your Mouth" moniker. I'm self taught... my mom and grandmothers did not have an extensive repertoire of recipes or willing to try something new, or try to tweak something you ate somewhere, or saw on TV, and there were a few cooking shows on when I was a child because I would watch them all the time. And, I watch the Food Network, etc. and any cooking competition on TV. I just wanted to comment and share my story. I'm glad I found this recipe since we're having Baked Beans tomorrow. I'm going to check out your blog and other recipes. I'm really excited about seeing what you have and what I'll be trying next of yours. HAPPY LABOR DAY EVERYONE!!! Love this recipe! Making it today for the second time! I used Bush's original baked beans because it says gluten free on label (for relatives) and it turned out beautiful! Just in case anyone is in a pinch. Also, tossed in crockpot after cooking in the oven until party time. Stayed yummy until we were easy to eat! Found your site looking for this type of recipe- will never use another baked beans recipe! Will visit back often! Thanks Mandy! I can smell it cooking for our dinner guests tonight- Mmm! It was good, but I do have a couple of suggestions as I think the long cooking time sapped some of the flavor. I'd assemble it the night before to let the ingredients come together. Bring it to room temp before cooking & cut the cooking time in half, & turn on the broiler the last few minutes to make the bacon crispy. I absolutely love this recipe! Sometimes I serve it up just as written. And sometimes I add raw diced onion and ground beef! Either way its always a big hit! Thanks for the great looking recipe! I'm bringing a side to an upcoming cookout, and it looks like I've found my dish! This sounds delicious!! Thank you so much for sharing. I can't wait to try this. 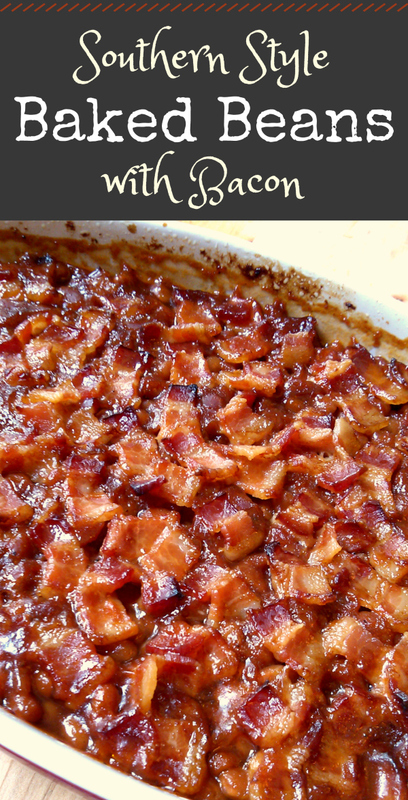 I just happened to see this recipe and I will be taking baked beans to our Father's Day cookout. I am going to make this recipe and am sure it will be a winner. I plan to use Bush Beans so there will be a little extra flavor added! This is the bomb! Love love it again for family coming in town for a special summer treat! This was soooo good, will definitely make it again and again. Thank you for this awesome and easy recipe. i am requested to bring the baked beans to any party, gathering or picnic. i don't drain the beans at all. i cut my 1 pound of bacon into 1" pieces and do a very soft fry and drain. i don't add any ketchup (yuck)nor do i add bbq sauce. what i add is brown sugar, 2 baseball sized onions cut into 1/4 rings, pepper & garlic powder to taste. when it 'tastes right' to me i then stir in the bacon. sorry i don't have measurements but i've never measured when making beans. my future daughter-in-law and her family likes them so much that she had me teach her how to do them. Made these the other day to go with my smoked ribs (with my homemade BBQ sauce) and we couldn't stop eating them. I did precook the bacon because I had a whole package that needed to be cooked before it went bad. I cut up the cooked pieces then scoop up some of the bacon grease and drizzled on top of the beans, threw the bacon on top and baked them for 1 hour. OUTSTANDING!!! I make my beans this way but always over-do an ingredient. Your measurements are perfect! Going to fix this today. Sounds wonderful. Sounds like my old bean recipe except I use molasses instead of the bbq sauce. I precook bacon to get rid of some fat and mix in with it all. More bacon, the better!! Girl I just had to tell you that I made your Southern Style Baked Beans recipe and Southern Style Potato Salad for my boys and they was still talking about them the next day. Lovin your recipes and tips. Thank you so much. I cut the recipe in half (just 2 of us) and it is in my oven now. Tater salad (yours with my twist and my friend sampled it and said it is the best he has ever had)is done and ribs just finished. Gawga gal in a Cali world and I can't wait to try these beans!!! Sounds so yummy I think I would add a chopped onion,extra bacon cooked and crumbled maybe a couple different beans like butter beans and kidney beans. The beans sound so great! I just have to ask again!! With all that bacon, IS IT TOO MUCH GREASE IN THE BEANS??? I made these baked beans again today - (I always chop a pile of onion into them) - BUT I only added ONE 28 oz of beans instead of two by accident. (Bush's - 'cause it's what I had). Girllllll......These were so good! My dad, from Texas, used to make this. One of my favorite things as a kid. No barbecue sauce and no liquid smoke, and he baked it for a long time til it was thick and the bacon was sooooo crispy. My dad was an excellent cook, unlike my mother, sadly. Good memories. Hey, do you think it would be okay to get everything mixed and add the bacon on top and then refrigerate it overnight and cook it the next day? LOL I'm glad y'all enjoyed it! I tried this tonight. I live alone so I used 2 cans of 15 ozs and cut everything in half. I added pineapple chunks on top. Really pleased with the way it came out. Will sure make it again. BTW...this is from an old 80 year old fossil that is just learning to cook. Thank you for sharing the recipe. Excellent. Don't you know 80 is the new 60?? :o) I think it's GREAT that you're trying new things and learning to cook. I'm glad you enjoyed the recipe!! Will definitely make these again!!! Great flavor! I added burger to mine that I fried with some onion!! Put it over some egg noodles and you got yourself a meal!!! Mandy Rivers both you and this recipe deserve a standing ovation,I made it tonight and it made my stomach happy. LOL well, I'm glad you enjoyed it! Made it and it was great we ate it with barbecue chicken one day and hamburgers the next, not a spoonful left,next time I going to add a little bourbon.They we're as good as those I have had at big barbecue places. I made this and it was great, we ate them with barbecue chicken, then hamburgers, next time I am going to add a little bourbon. These were as good or better than those I have had from the big barbecue places. I've started snipping my bacon almost any time a recipe calls for bacon now. I love how easy it is to just grab a pair of kitchen shears and snip away :) I will be adding this recipe to my box of ones to try out. Thanks for sharing it!